OKLAHOMA CITY – State Reps. Sean Roberts and Tess Teague filed six pieces of legislation today aimed at maximizing classroom dollars and minimizing administrative waste. The new measures come after both lawmakers talked extensively with constituents and educators. The six bills were filed as part of the 2017 second special legislative session. House Bill 1043XX, which enforces a performance audit of the State Department of Education. This would be performed by the state auditor. House Bill 1044XX, which requires the Commissioners of the Land Office (CLO) to provide every teacher with a $500 annual stipend for classroom supplies. House Bill 1045XX, which caps superintendent salaries to that of the governor’s. The governor’s salary is currently $147,000 per year. This legislation mimics federal law. 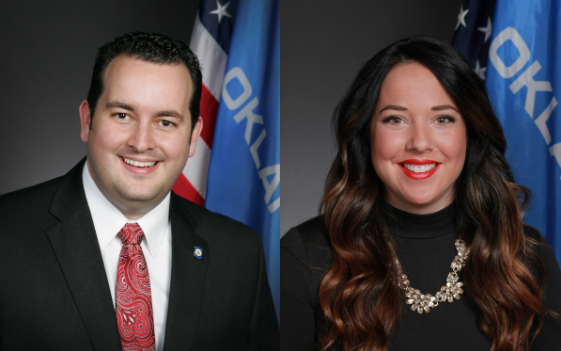 House Bill 1046XX, which consolidates superintendents across Oklahoma’s more than 500 school districts. This would only affect counties with populations less than 400,000. House Bill 1047XX, which requires the state superintendent to submit to the Legislature and the governor a rolling five-year plan to meet existing and future public education needs for funding and policy reform. House Bill 1048XX, which reallocates $15 million of lottery funding for textbooks and curriculum technology. “Over and over again, I listened to constituents and teachers voice concern about lottery funds, what the CLO was doing with the $2 billion it has in its account and why school administration was making so much money. Our hope is to make certain lawmakers are appropriately spending taxpayer dollars, and these smart measures are a crucial step in doing so,” said Roberts.